NEW. 9781474260763 This listing is a new book, a title currently in-print which we order directly and immediately from the publisher. Print on Demand title, produced to the highest standard, and there would be a delay in dispatch of around 10 working days. For all enquiries, please contact Herb Tandree Philosophy Books directly-customer service is our primary goal. Very Good. Trade paperback (US). Glued binding. 89 p. Methuen Student Editions. Based on real events that took place in Oyo, the ancient Yoruba city of Nigeria, in 1946, Nobel Prize-winner Wole Soyinka's play tells how Simon Pilkings, a well-meaning District Officer, intervenes to prevent the ritual suicide of the Yoruba chief, Elesin. This Student Edition includes a full introduction, commentary and questions for study. Good. Trade paperback (US). Glued binding. 84 p. Contains: Illustrations, black & white. Based on the real events that took place in the ancient Yoruba city of Nigeria in 1946, this play tells how Simon Pilkings, a district officer, intervenes to prevent the ritual suicide demanded by the death of the King. There follow drastic repercussions in both indigenous and colonial communities. New. 2003. 1st. Paperback. 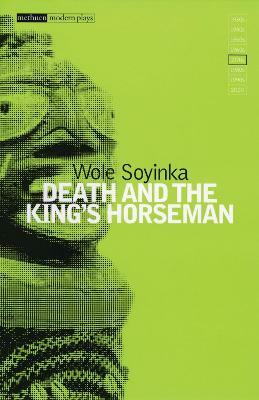 Based on real events that took place in Oyo, the ancient Yoruba city of Nigeria, in 1946, Nobel Prize-winner Wole Soyinka's play tells how Simon Pilkings, a well-meaning District Officer, intervenes to prevent the ritual suicide of the Yoruba chief, Elesin. This Student Edition includes a full introduction, commentary and questions for study. Series: Student Editions. Num Pages: 160 pages, Ill. BIC Classification: DD; DSG. Category: (UU) Undergraduate. Dimension: 198 x 131 x 11. Weight in Grams: 138......We ship daily from our Bookshop. New. Trade paperback (US). Glued binding. 89 p. Methuen Student Editions. Fine. 100% Money Back Guarantee. Brand New, Perfect Condition. We offer expedited shipping to all US locations. Over 3, 000, 000 happy customers. Trade paperback (US). Glued binding. 89 p. Methuen Student Editions. This is a complex and very interesting play surrounding the clash between the African tribe of the Yoruba and the Western influence. Although this occurs, the play actually has a deeper conflict, and deserves to be read multiple times for the true interpretation and understanding. It is a challenging read and should be accompanied by critical essays which are essential to complete understanding.